If you missed the Cookie Johnson interview this past Sunday on “Super Soul Sunday” you should check it out. After watching the interview, I ran out and picked up my copy of “Believing In Magic” and can’t wait to read it. 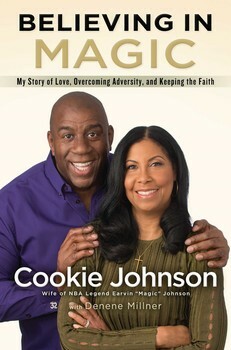 Cookie, always so graceful, discusses the challenges she faced in her public marriage to basketball great Earvin “Magic” Johnson. In her new memoir, she shares details of their marriage, motherhood, faith, and how an HIV diagnosis twenty-five years ago changed the course of their lives. Believing in Magic isn’t just a story about their marriage its about keeping faith and not losing your way. It’s about a marriage that has endure test after test and the power to overcome with the mercy and grace of God. She has never shared her journey publicly. Believing in Magic is her story and her testimony.